The Ulster Chess Union award James Fairley and Geoff Hindley Honorary Life Membership of the Ulster Chess Union. At Methodist College on 12th January 2019. 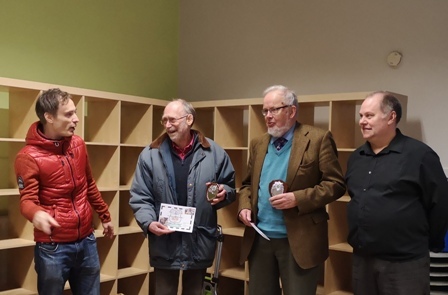 Brendan Jamison the UCU Tournament Director and League Controller as representative of the Ulster Chess Union Executive under the chair of Ross Harris awarded James Fairley and Geoff Hindley Honorary Life Membership of the Ulster Chess Union. The event was the January Childrens Chess Tournament - the tournament had finished and the award ceremony was about to start when Brendan announced that a special couple of awards were to be given. 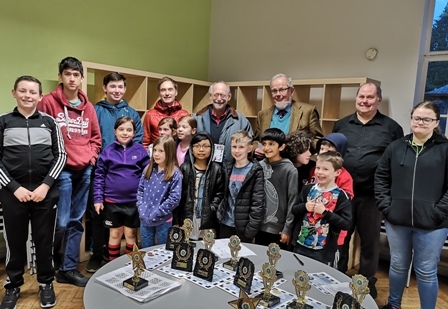 The Ulster Chess Union values the introduction of the game to youngsters and the series of Childrens Chess has seen players come in and then go to win the Ulster Chess Championships as young adults. Geoff Hindley and James Fairley as volunteers have for many years been a key part of the running of these events. UCU in recognition and thanks for all their hard work and time are awarding them Life Honorary Membership of the UCU. They were given shields and certificates and a large round of applause.